Discussion in 'Mac Apps and Mac App Store' started by Cindori, May 5, 2014. Hi! I'm a Mac OS X developer from Sweden, I usually hang out in the Mac Pro forum and some may recognize previous apps of mine (like Trim Enabler). I've just released my latest software, Control Center for Mac and would love some thoughts and criticism! 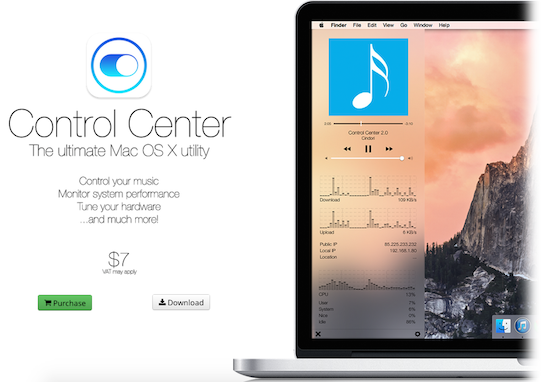 Control Center for Mac is a multi-utility minimalistic app that lets you control and monitor most aspects of your computer. You can use it for controlling music (iTunes/Spotify/Radium/Rdio), monitor your system, and much more. The app is $7, with a 7 day free trial. Mountain Lion or later OS is required. Would greatly appreciate your thoughts, what you like/dont like, suggestions etc. I like it, but I have a problem. It's following my mouse, even after I hit the shortcut to turn it off! You also need to put a quit button. It looks like good! but freeze app when Tweaks control on. My Mac is MacBook Air Mid 2013 13inch. PS. other button are good response ! How do you mean when you say "follow my mouse"? You mean the touchpad? I will add settings for the touch pad. I will also put a quit button in the menu settings, for now you can also quit by clicking the panel and CMD-Q. But if you don't want to register you can send the crash log to me here instead by private message, I really would appreciate it! I mean it follows my curser. I don't think it's supposed to do that? Thanks for the follow-up, looking forward to the next update. That should definitely not happen. What Mac and OS version are you using? Thanks for all the bug reports. Been pushing out several updates over the last few weeks that should fix alot of issues, especially the crashes. Looking to expand functionality now. This looks good. What will you offer next? Version 2 is now out! It offers a redesigned user interface and new great system monitoring widgets! Currently working on expanding the range of widgets for Control Center. I'll make this change in the next update! Definitely going to be buying this application soon. Looks great! I am a TOTAL KNOB!!! LOL that was it!! Thanks a ton! Now I just have to get Little Snitch working again and I am cooking with Gas! By the way, that will happen with some apps like Minecraft. It must be turned off to open them. Can you use it to monitor a small network of macs- cpu, memory, temp etc? This is a great looking app, and I've invested and purchased this along with the trim enabler. My question is, really how do I use it? Is there a user guide? I'm not the most tech savvy, and now that I have it, how can I use it day to day? I know about battery life, etc. But I've never had those issues, and while they may happen, is there more things I can check, or processes to enable, that will help me daily run better? I am trying to run control center for Mac on my MacBook Pro Retina running Yosemite 10.10.3 beta 2. Most of the time I can't get it to actual show, pressing the show button does nothing. When I can get it to work it is graphically messed up. Finally, is there no dark mode icon for the menu bar?